Archibald Claude Victor Rowsell, known as Archie, was born in Yeovil on 4 November 1897. He was the son, and third of the four children, of bricklayer William Rowsell (1874-1936) and Bessie née Rose (b1873). William and Bessie's children were William Charles (b1893), Ivy Kathleen (1894-1936), Archie and Horace Baden (1900-1920). A fifth child died in infancy. In the 1901 census the family were listed at 12 Mary Street. By 1911 they had moved to 4 Crofton Avenue and at this time 13-year old Archie was working as an errand boy in a furniture shop - possibly the business of Thomas Jesty in the Triangle. The family later moved to 4 Crofton Avenue. Shortly after the outbreak of war, in August 1914, Archie enlisted at Yeovil. He was only seventeen. He joined the 63rd Field Company, Corps of Royal Engineers. His Service Number was 41338. Archie's father, William, enlisted in the Royal Engineers on 31 August 1914. His Service Number was 44671, which indicates that Archie had enlisted almost on the day war was declared. When the expansion of the army was sanctioned in August 1914, it required four Armies each of six Divisions to have two Field Companies of the Royal Engineers each; that is, 48 new Field Companies. 63rd Field Company was allocated to the 9th (Scottish) Division. Archie was sent to France almost immediately after his basic training and saw action at the Battle of La Bassée. This was fought by German and Franco-British forces in northern France in October 1914, during reciprocal attempts by the contending armies to envelop the northern flank of their opponent, which has been called the Race to the Sea. The German 6th Army took Lille before a British force could secure the town and the 4th Army attacked the exposed British flank further north at Ypres. The British were driven back and the German army occupied La Bassée and Neuve Chapelle. Around 15 October, the British recaptured Givenchy-lès-la-Bassée but failed to recover La Bassée. German reinforcements arrived and regained the initiative, until the arrival of the Lahore Division, part of the Indian Corps. The British repulsed German attacks until early November, after which both sides concentrated their resources on the First Battle of Ypres. The battle at La Bassée was reduced to local operations and it is likely that Archie joined his unit at the Front at this time. In late January and early February 1915, German and British troops conducted raids and local attacks in the Affairs of Cuinchy, which took place at Givenchy-lès-la-Bassée and just south of La Bassée Canal, leaving the front line little changed. The 63rd Field Company next saw action at the Battle of Neuve Chapelle (10 - 13 March 1915). This was a British offensive in the Artois region of France and broke through at Neuve-Chapelle but the success could not be exploited. More troops had arrived from Britain and relieved some French troops in Flanders, which enabled a continuous British line to be formed, from Givenchy-lès-la-Bassée north to Langemarck. The battle was intended to cause a rupture in the German lines, which would then be exploited with a rush to the Aubers Ridge and possibly Lille. A French assault at Vimy Ridge on the Artois plateau was also planned, to threaten the road, rail and canal junctions at La Bassée from the south, as the British attacked from the north. Archie, with his company, next became embroiled in the Battle of Loos (25 September - 15 October 1915). This was the British Army's contribution to the major Allied offensive launched simultaneously with the main French offensive in Champagne. It was the biggest British attack of 1915. A continuous preliminary bombardment, which showered 250,000 shells on to the German defences over four days, had little real effect. Before sending in the infantry on the morning of 25 September 1915, the British released 140 tons of chlorine gas from 5,000 cylinders placed on the front line to make up for the ineffective artillery barrage. This was the first time the Allies had used the weapon, coming after the Germans employed gas to terrible effect at Ypres in April earlier in the year, and it was hoped it would annihilate the Germans at Loos. However a change in the direction of the wind at several points along the front blew the gas back into the British trenches, causing seven deaths and injuring 2,600 soldiers who had to be withdrawn from the front line. Initially the gas attack created panic among the Germans and close to 600 men were gassed. Despite the setbacks caused by the wind 75,000 British infantrymen still flowed out from the trenches when the order came. British losses at Loos were exceptionally high with 50,000 casualties, including at least 20,000 deaths. Following the Battle of Loos most Divisions, having suffered enormous casualties, took the rest of the year to rebuild. From July 1916 the 63rd Field Company took part in the Battles of the Somme. The Battle of the Somme, also known as the Somme Offensive, was fought by the armies of the British Empire and France against the German Empire. It took place between 1 July and 18 November 1916 on both sides of the upper reaches of the River Somme in France. The battle was intended to hasten a victory for the Allies and was the largest battle of the First World War on the Western Front. More than three million men fought in this battle and one million men were wounded or killed, making it one of the bloodiest battles in human history. At the start of the battle, Archie was shot in the leg and severely wounded. He was hospitalised but his leg was amputated but blood poisoning set in. Archie died of his wounds on 23 July 1919. He was aged just 18 years and 8 months. The Western Gazette, in its edition of 28 July 1916, reported "Official notice was received on Friday by Mrs Rousell of Goldcroft, that her son Sapper Archie Rousell, of the Royal Engineers, had been wounded in the leg by gunshot, and was lying seriously ill in hospital. On Sunday, Mrs Rousell received further intelligence that one of his legs had been amputated, and blood poisoning having set in he had succumbed to his wounds. Sapper Rousell had joined the Army at the commencement of the war, and had been at the Front 18 months. He had been through the battles of Neuve Chappelle, La Basee, Loos, and the “Great Push”. Sapper Rousell was home on leave a few months ago, and brought home some very interesting relics. Mrs Rousell’s husband and two other sons are serving their King and country." 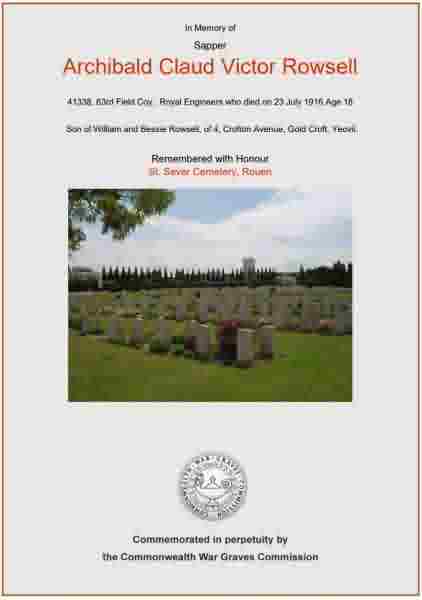 Archie was interred in St Sever Cemetery, Rouen - Grave A.34.14 - and his name is recorded on the Yeovil War Memorial in the Borough. Archie's brother Horace died in 1920 - click here. The Commonwealth War Graves Commission certificate in memory of Archie Rowsell.